A kingfisher has been frequenting Top Pond. It sits in a tree on the island. Given the size of the carp in the lake you might wonder what it is eating. 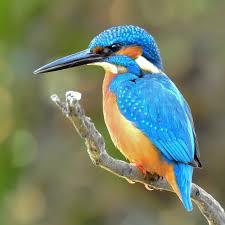 The fact is that kingfishers take a wide variety of prey including insects, spiders and centipedes. So it has no need to pitch itself against the giant fish in the pond, but can search for smaller prey (perhaps even fry) in the surroundings. It has also been seen on North Lake, which is on the route taken by the train. 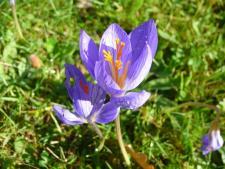 Autumn crocuses (Colchicum autumnale), also known as Naked Ladies because they appear long after their leaves have become dormant, are flowering in the long grass near Exbury House. A British native, they superficially resemble true crocuses but belong to a different family. One difference is that they have 6 stamens, whereas true crocuses have only 3. Lovely though they are it is best to bear in mind that all parts of the plant are extremely toxic. Fungi are appearing in lots of places; the damp conditions and the amount of rain we have had seems to have favoured them, and it looks as if their season is starting early. I photogaphed (left) these collared earth stars, which look like a puffball in the centre surrounded by a ruff, on one of the flowerbeds where bark mulch has been spread. 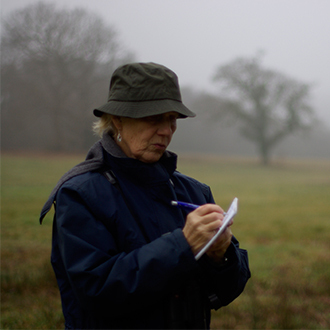 They are often found in woodland. 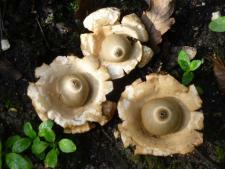 Their spores are released through a hole in the top of the central sac. They have no stem so sit directly on the earth. 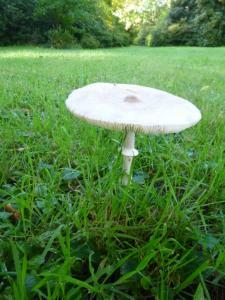 A commoner type is this parasol (right), which grows in well drained soil, often in grass.